Hello, please come in and have a seat. I set the table for you! This past Sunday I woke up craving my favorite breakfast from a little bistro that I love, but I couldn’t go because my Husband was working in the garage and Jenny was at her boyfriend’s house, so I stayed home. After all it’s not fun going to a restaurant by yourself. 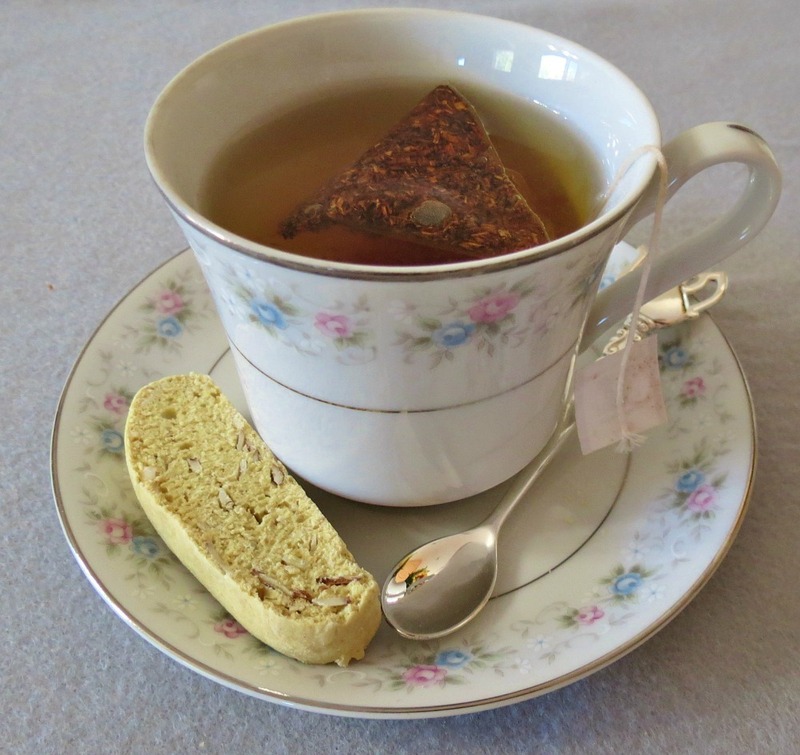 My favorite thing from the bistro are these little anise biscotti that they bring you with a cup of coffee. 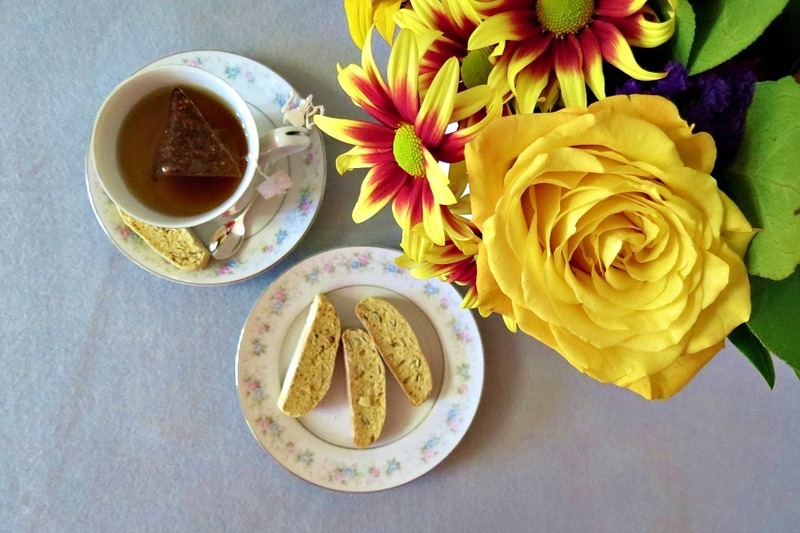 I love those biscotti. I was really craving them, so I thought why not make some? After all this has been on my food bucket list for a year now! Since I was home bound I decided to throw you and I a little tea party! 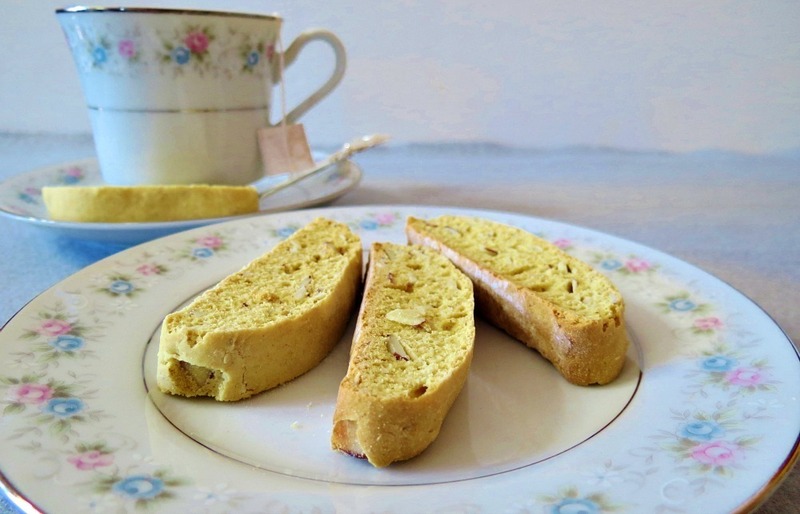 These biscotti are crunchy, but not to crunchy and have the slightest flavor of anise and almond. I added one cup of slivered almonds to them for a little added crunch and flavor. I am very pleased with the outcome. I wasn’t sure at first because the dough is a little sticky, but nothing that a little roll in some flour couldn’t fix! Do you like my fine china ware? They were my Mom’s. I always loved them as a kid and before she moved to North Carolina she gave them to me. I love them so much and they remind me of Thanksgiving. It was one of the few times of year she would bring them out. Thanks Mom for giving them to me! I do love them!! I thought having a little tea party would be the perfect opportunity to use them. 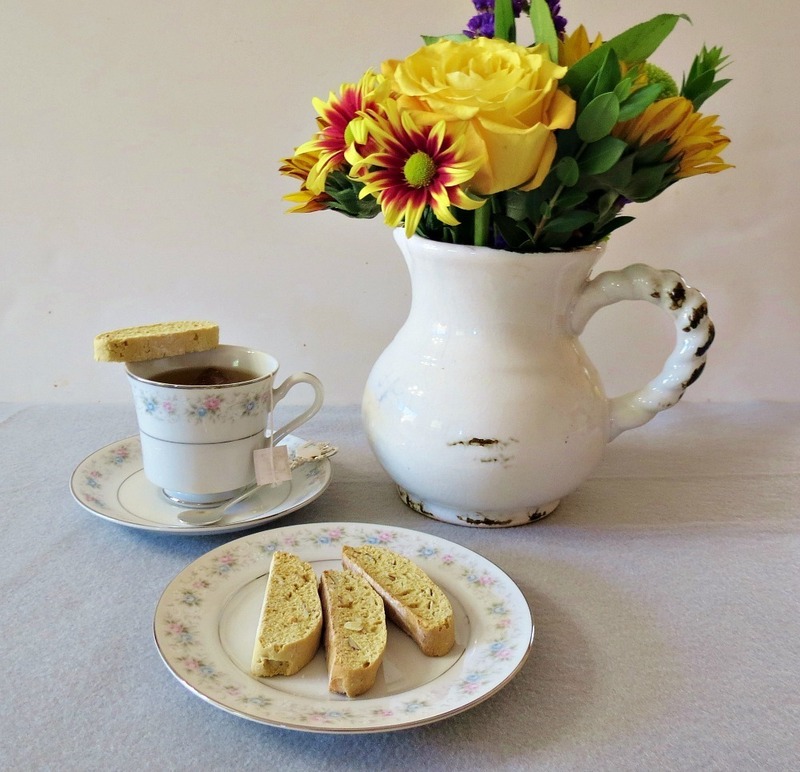 These little biscotti’s would be wonderful to serve at a brunch or to give as a gift at Christmas time. Yes I’m already thinking Christmas. Plus you can freeze them for later!! I debated about adding a lemon glaze to the biscotti to add some more sweetness to them, but as you can tell from this weeks recipes, that I don’t need anymore sugar. I recommend adding some glaze if you like. Just take 1/3 cup powdered sugar and mix with a dash of lemon juice until it’s a constancy you like, then drizzle over the biscotti. I know lemon would just be wonderful on them!! 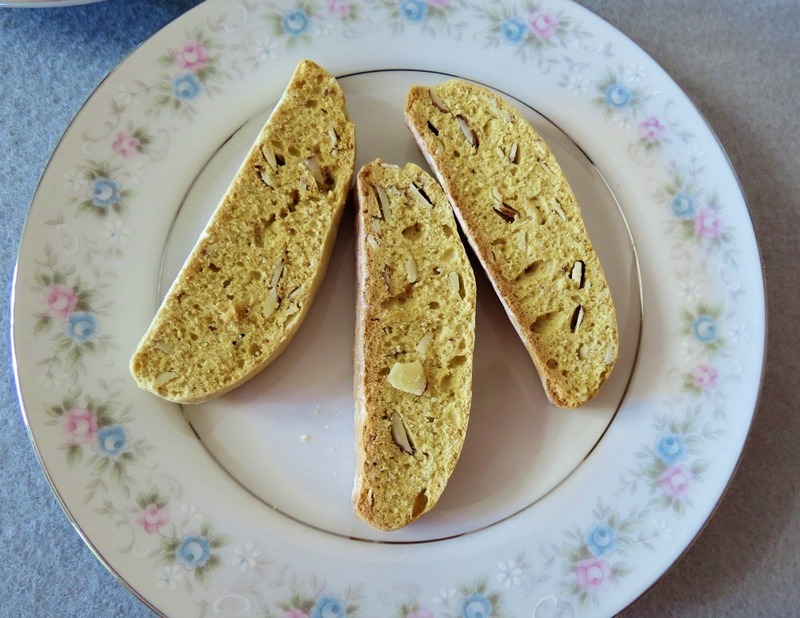 A crisp and crunchy Italian cookie with the flavors of almond and anise. Preheat the oven to 350F degrees, and position the oven racks in the upper and lower thirds positions. Line two baking sheets with parchment paper; set a side. In the bowl of an electric mixer, beat the butter and sugar on medium speed until creamy. Add the eggs, one at a time, beating well after each. Continue to beat the mixture for 2 minutes more. Beat in the almond and anise extract. In a medium bowl, whisk together the flours, baking powder, and salt. Slowly add the flour mixture into the sugar and butter mixture; mix until just incorporated. Transfer the dough to a floured work surface, and divide the dough into 3 equal pieces. Shape each piece into a 12-inch log, space two of the logs 2" apart on one of the prepared baking sheets and the third log on the second sheet. Bake for 15-18 minutes, until golden on top and lightly cracked. Half way through the baking, rotate the baking sheets. Remove the sheets from the oven and allow to rest for 10 minutes. Reduce the oven temperature to 300F degrees. Using a serrated knife, cut each log on the diagonal into ¾-inch slices. Lay the slices on their sides and bake in the oven for 10-15 minutes, or until lightly golden. Turn the oven off and open the oven door to let the biscotti cool in the oven. I hope you enjoyed our little tea party! Thank you for coming. Please stop by anytime, my door is always open! Have a super lovely day!! P.S. These little guys would also be perfect as an evening snack served with a cup of chamomile tea just before bedtime! I think that is what I will do this evening! Question: Do you ever throw a tea party? You definitely made lemonade out of lemons with these cookies! I love the flavor combo! What a great flavor for biscotti. I have never made my own, I need to get on that! Oh you should try it! It’s pretty quick and easy! I bet yours would turn out wonderful!! I don’t mind going fast food or even Panera by myself, but not breakfast or dinner that just seems weird to me. Being Italian, we make a lot of biscotti in my family. I love adding anise! 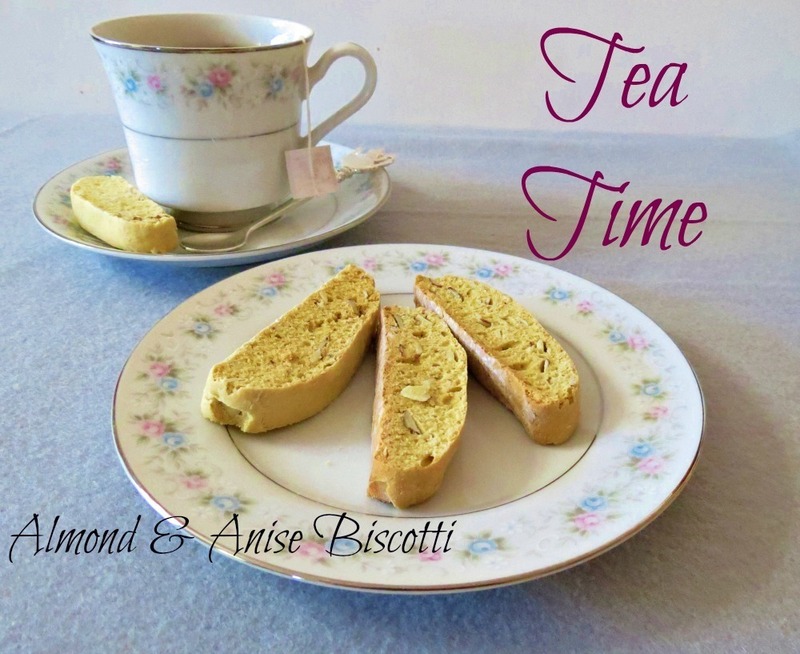 I like the subtle flavor of anise in this almond-y biscotti. Just perfect with a cup of tea. Thank you! I don’t like a real strong taste of anise either! Otherwise it can really take over the cookie! I plan on making these this weekend. I made your pumpkin biscotti was a first attempt at biscotti. I didn’t realize they would rise of much and I ended up having a biscotti bread that was quite big and didn’t cook evenly. The flavor was wonderful though. There was too much sugar in there for me. Did you experiment at all with adding applesauce or other sugar alternatives. Thanks so much for insipring me to cook and bake.